HUGE News! Because of you….huge donations!! Well….I just thought I would send a HUGE shout out to you guys! 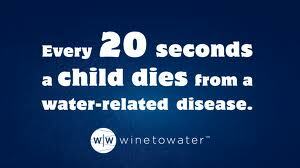 Because of YOU I was able to write a check for $968.00 this afternoon to an organization called Wine To Water!! What is Wine to Water….no it is not cases of wine for us to share, although it could be, but it’s not…at least not yet. 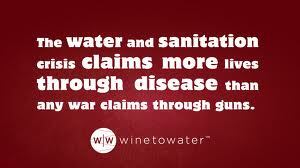 I will explain more about Wine to Water a little later, but thought I would tell you what happened first. I have taken the payments for this 6 week session and written a check to Wine to Water. Over the past year, almost two years, I have been trying to figure out how to spend some of the money that I have been making at No Excuses (it’s not a ton of money, but FUN money to me-my “mommy” stash)! One of my grand plans was to save for a new kitchen, but at this rate I think I might be in a wheelchair by then! So, I’ve thought about going on a grand vacation, but myself wouldn’t be very much fun!! I thought about using it towards a down payment on a car, a new bathroom, and so on. Lots of BRILLIANT ideas of how to spend money come out of this brain (just ask Jim)!! Don’t worry…I still hope to do some of my brilliant ideas….but I realized….I have been given so much that I need to give something back. I know $968.00 isn’t CRAZY MONEY, but to me it is, especially in one lump sum. More importantly-it comes from ALL OF US!! So, what is this Wine to Water and why did I pick this organization? Second, he was so HONEST! This man is far from perfect and was able to share how imperfect he really is! Third, he is doing something I have been hearing about a lot recently (I don’t mean to be ignorant, I just didn’t know it was SUCH a problem), the lack of healthy drinking water for women and children in foreign countries. The statistics are SHOCKING!! 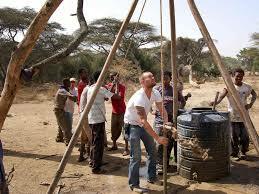 Clean drinking water is something I definitely take for granted. 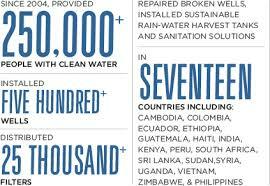 For every dollar donated a child can drink clean water for a year! Amazing! If for some reason you want your money to go directly into my “kitchen fund” please let me know. Knowing all of you, as I have been able to do over the course of the past year, I am confident that you trust me to put this money to good use. THANK YOU!!! PS- GREAT workout this morning…that was TOUGH!! See you Wednesday at 5:15 am! ← What Now? Class starts Monday!! Huge Rewards for some of you! !